Enrich your cooking with Port, Sherry, Madeira and Marsala. The fresh produce, barbecues and rosé wines—the culinary boys of summer—have all gone home for the off-season. Taking their place as the days grow shorter and colder are heartier and richer foods that must be made in the kitchen. And one of the best ways to obtain the additional flavors you desire is to employ fortified wine as a lead ingredient in whatever you might be whipping up. 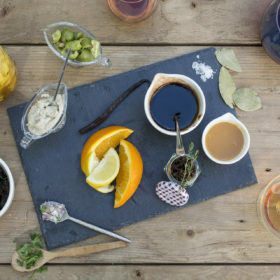 Often underappreciated as everyday drinking wines, Port and Madeira from Portugal, Sherry from Spain, and Marsala from Italy are all capable of bringing invaluable flavor and an extra level of depth to a range of foods—sauces and dressings in particular. Bolstered with brandy and higher in alcohol (usually 17 to 21 percent) than table wines, fortified wines stand up well to the heat of cooking. In a nutshell, they are masters at holding onto their core flavors, which are generally sweet and highly concentrated. And because the wines have been strengthened, they will last for several months after opening. Which is no small bonus if you’ll be doing a lot of cooking this winter. Realizing that Pairings is all about getting you in front of the stove, we don’t want to drum on too long about what is a Malmsey Madeira as opposed to a Bual Madeira. Or what is oloroso Sherry versus palo cortado; or tawny versus Vintage Port. That said, it’s important to know something about the styles and origins of the world’s top fortified wines before firing up the burners. Port, which hails from the Douro Valley of Portugal, is a fortified red wine (the others are all made from white base wines). The two types of Port most often used in cooking are ruby Port—a bright, fruity, young wine—and tawny Port, which is aged in wood and takes on a tawny, brown color and more complex flavors of toffee, chocolate and caramel. Vintage Port, meanwhile, is a wine meant for aging and drinking on its own. Late Bottled Vintage Port is also a more refined wine that should be sipped by itself or with food. Sherry, which comes from the extreme southwest of Spain, is made by many Sherry houses in a number of styles, ranging from the ultra-dry fino and manzanilla up through amontillado, oloroso and palo cortado, and finishing with the sweet, syrupy cream and Pedro Ximénez versions. Amontillado and oloroso are arguably the two best classes of Sherry to cook with, as they both impart clear-cut nuttiness along with mushroom and toffee notes. Madeira comes from a like-named Portuguese island off the coast of Morocco. The four major grapes used to make Madeira, in increasing order of sweetness, are Sercial, Verdelho, Bual and Malmsey. For cooking, we recommend a Reserve-level wine, which will have been aged for at least five years. 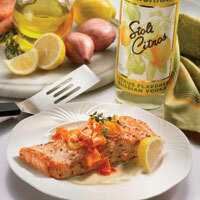 A Special Reserve, with 10 years of age, will only intensify the flavor of your sauce or salad dressing. And if you wish to purchase a bottle of Madeira for post-dinner drinking, then we suggest an Extra Reserve or a vintage-specific bottling from a high-quality producer. Marsala is a product of western Sicily. It comes in dry (secco), semidry (semisecco) and sweet (dolce) styles, and when a dry or semidry version is reduced with pan drippings and then thickened with some cornstarch, it makes a fabulous sauce for breast of chicken or thinly sliced veal. Not to be overlooked is a good fortified wine’s pairing potential with nuts, fruits and especially cheeses. In fact, if you are in possession of or are looking to buy an aged Port, Madeira or Sherry, we’d rather you sip it with some English Stilton, a Spanish Torta del Casar or an aged goat cheese rather than cook with it. But who are we to say? Why not trust a sommelier? Jimmy Hayes, the new head sommelier at Per Se in New York, professes to be a “great fan” of old Madeira matched with various cheeses. Cooking with Sherry is made easier by a keen British Web site called Ten Star Tapas. The site is loaded with just about everything you’d ever want to know about Spain’s star fortified wine, from its storied history to what’s happening today in the trio of Andalucian towns where Sherry is produced. Best of all, you’ll find a plethora of recipes from top chefs in the U.K. and Europe. The following is an adapted recipe from Angela Hartnett, a trail-blazing English chef at The Connaught in London. To learn how to prepare other tantalizing dishes, log onto www.tenstartapas.com. In a large frying pan or skillet, heat olive oil over medium-high heat until it ripples. Add shallots and cook, stirring, until tender and translucent, about 5 minutes. Remove shallots from pan and set aside. Add chorizo to same pan and sauté, stirring, until lightly browned. Add red wine, palo cortado, bay leaves, thyme and reserved shallots. Simmer until wine is reduced in volume and slightly thickened. Remove from heat, set aside and keep warm. In another pan, heat chili oil and quickly sauté shrimp, stirring, until pink and firm, but be sure not to overcook. Remove from heat and sprinkle with parsley. Spear chorizo slices and shrimp on skewers, alternating the chorizo and the shrimp and allowing 2 shrimp per skewer. Arrange skewers and slices of crusty bread on serving platters. Remove thyme sprigs and bay leaves from sauce; drizzle sauce over skewers. Serve immediately. Makes 8 skewers. Wine recommendations: This appetizer will taste great with the same palo cortado Sherry you used to make the dish. We especially like the Peninsula bottling from Lustau; other options include Hidalgo’s Jerez Cortado and Gonzalez Byass’s Apostoles. Laurent Tourondel, the executive chef and driving force behind the BLT group of restaurants in New York, says he loves cooking with Port. For his recipe for a warm paté of chicken livers spread atop toasted country bread, Tourondel points out that a good-quality ruby Port simmered with seasonings significantly enhances the flavors of the spread. To make the reduction: Tie the bay leaf and 2 sprigs thyme with kitchen twine. In a small, heavy saucepan set over medium-low heat, bring Port, herb bundle, sliced shallot and garlic to a simmer. Cook until Port is reduced to the consistency of thick syrup. Remove herb bundle. Remove from heat and keep warm. To make the chicken livers: Season livers with half tablespoon sea salt, some pink salt (if using) and pepper. Heat 1 tablespoon duck fat or oil in a large skillet over high heat. When it ripples, add half the livers and brown on one side, about 2 minutes. Turn and cook on the other side until golden brown but still pink in center, about 1 minute more. Stir in 1 tablespoon each of chopped shallots and garlic; then pour in 1Â½ Tablespoons brandy or Cognac and heat, about 2 minutes. Remove to a bowl and repeat with remaining livers, salt, shallots, garlic and Cognac. In a food processor fitted with a metal blade, combine the browned livers and Port syrup and process until smooth. Blend in butter, season to taste with additional sea salt and pepper. Scrape into a terrine or serving bowl. To serve: Remove leaves from remaining thyme sprigs. Sprinkle chicken liver spread with thyme leaves and Fleur de Sel and drizzle with olive oil. Serve warm with toasted country bread and cornichons. Serves 6. Wine recommendations: BLT’s beverage manager Fred Dexheimer believes that a nice rosé Champagne is the proper wine to sip with this paté. Sticking with that theme, we also like Canella’s light-bodied but lovely sparkling rosé of Pinot Noir from the Veneto region of Italy. As the holidays roll around, nothing beats a roast, be it beef, lamb or pork. The following recipe (adapted from a recipe from www. cooks.com) for glazed pork loin topped in a cider-Madeira sauce provides enough sauce for 20 portions. However, you can serve fewer guests simply by working with a smaller roast. At about Â½ to Â¾ pound of meat per person, you decide how big a roast to use; but by all means make the full batch of sauce. More is always better, and you won’t want to skimp. To roast the pork loin: Preheat oven to 325Â°F. In a large, heavy roasting pan that can be used on the stovetop as well, heat oil over high heat until it ripples. Place the pork loin into it and brown each side. Remove pork loin from the pan, place a rack into it and place pork loin on the rack, fatty side up. Roast for 20 minutes per pound or until a meat thermometer inserted into the thickest part reads 165Â°F. Brush with glaze twice during the roasting time. Remove from the oven and let rest for a few minutes. To make the sauce: While the pork is roasting, combine cider, Madeira, shallots, and allspice in a heavy saucepan and simmer over medium-low heat until liquid is reduced in volume by half. When pork loin is done, transfer to a serving platter. Deglaze the roasting pan by adding beef broth and stirring to scrape up any browned pork bits. Pour broth into a 2-cup measure and skim off fat. Add skimmed broth to cider-Madeira mixture and bring to a boil. Whisk in cornstarch mixture and simmer about 2 minutes. Then whisk in butter. Remove from heat and whisk in mustard. Strain, season with salt and pepper to taste and transfer to a gravy boat for serving. Makes 4 cups sauce. Wine recommendations: The sweet-and-sour unctuousness of the glaze and sauce on a fairly neutral canvas such as pork loin calls for a wine with moderate to full acidity, but also some matching sweetness. Our first choice would be a cru-level Alsatian white wine, including Pinot Gris, Gewürztraminer or Riesling.